The food, the music, the atmosphere: nothing says summertime like a good street festival. This year's Sicilian Festa did not disappoint. 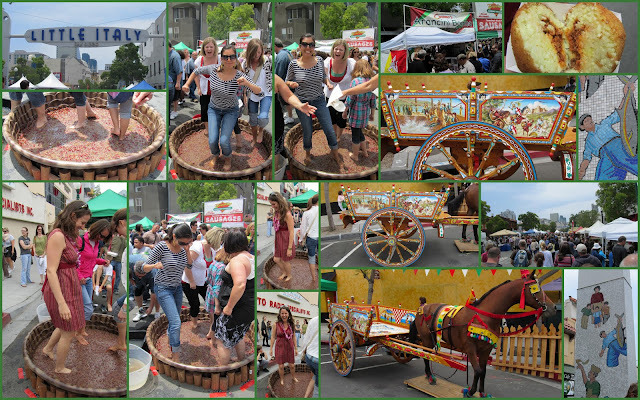 Held annually in San Diego's Little Italy, this year visitors got to squish grapes (with their feet! ), savor arancini, and discover a bit of San Diego Harbor's Sicilian heritage. As a special treat, Giada De Laurentiis made an appearance to sign copies of her latest cookbook and do a cooking demonstration. Don't forget to enter my giveaway. One more week to go! Aren't they wonderful!?? Someday when we go back to Sicily, we will buy ourselves a little handmade replica of such a cart! oh my gosh, that looks so awesome!!! I'm a big fan of Giada's cooking. How fun squishing grapes! I've never had the opportunity to do that. hmmmmmm. You had me at arancini. @Krystal - That's why I volunteered to help out at next year's festival. Ha! @Elisa - Neither had I which is why it was so hard to resist! @Globetrotting in Heels - I've never seen them anywhere else in SD and when I asked, the co. said they only make them for this festival!